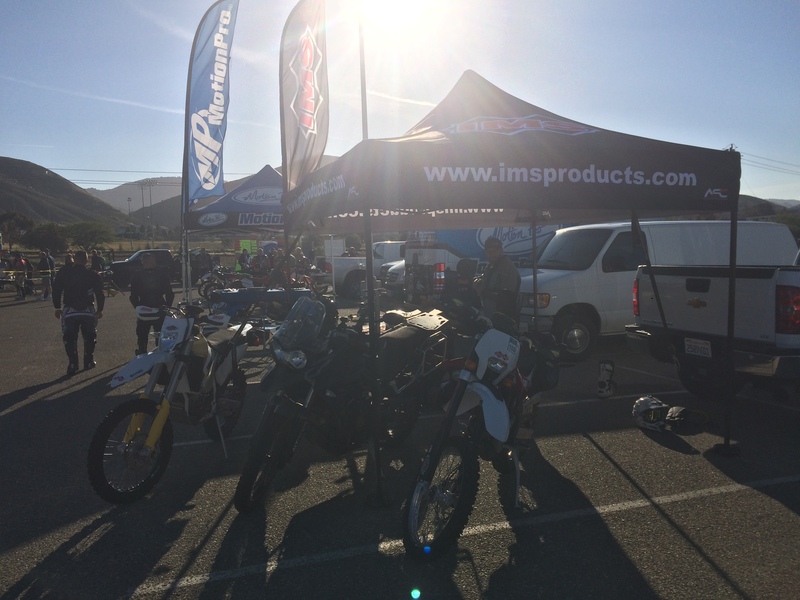 This last weekend the IMS crew had the great opportunity to participate in the Cal Poly Penguins Hi Mountain 125 in the hills of San Luis Obispo CA. At the ride was the owner Scott Wright on a new Husky 501, Chris Hardin, manager, on a Husky 310 and I, Ethan Sullivan, blog writer and elementary school teacher, on the IMS Triumph Tiger 800XC. 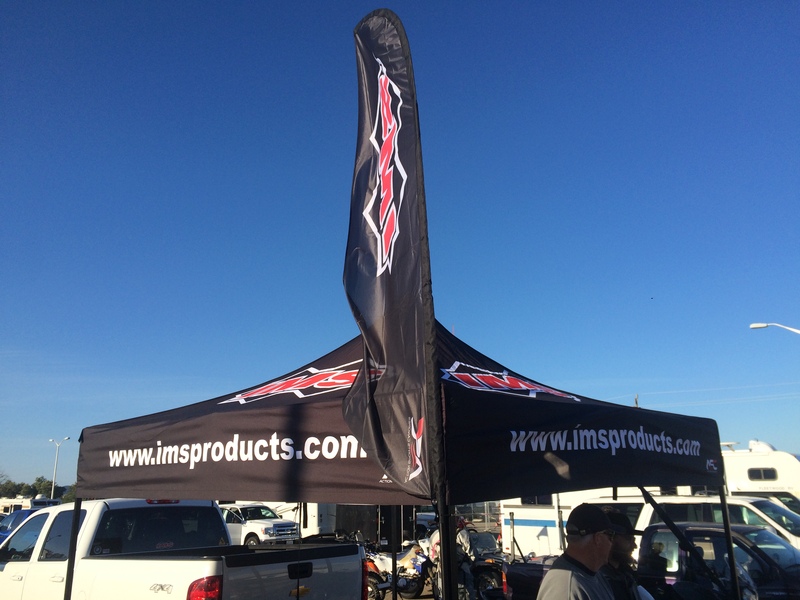 The bikes at the IMS booth. I have owned the IMS Triumph Tiger for the last 9 months and the bike has always ran flawlessly. As I was quickly approaching the 6,000 mile warranty service mark, I figured now is as good a time as ever to replace the old worn out TKC80 with a new one, and kill two birds with one stone. This also gave me the peace of mind that the bike would have fresh oil, and completely checked out for what was going to be one of the tougher rides I have ever done on the bike. 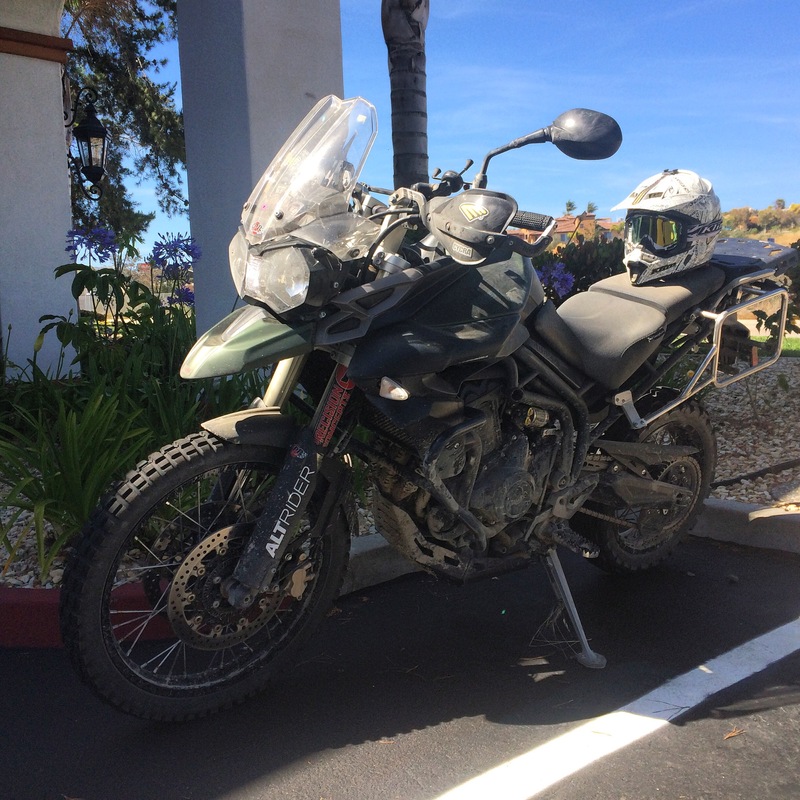 The ride wasn’t until Sunday but for me it started a day earlier, with riding the bike down from Monterey to Pismo to the hotel I was staying in. I had originally wanted to leave in the late morning, early afternoon, and cruise Highway 1 all the way down, much like I had done during Thanksgiving. But as life and luck would have it, I was not able to leave until almost 6pm. Since I didn’t want to get stuck on the 1 at night for to long, I decided to slab it down the 101. Now, where as the 1 from Monterey to Pismo is a gorgeous, an amazing feat of engineering and breathtaking beauty, the 101 is a great study in efficiency and practicality. It is almost arrow straight, carving it’s own way through the state of California, not following any route other then the one decided on by man. This means that getting from Monterey to Pismo took just about two and a half hours, verses the three and a half along the 1. As it was I arrived in Pismo just a few minutes after total darkness, (after a brief stop at Firestone Walker Brewery, the one main highlight of the 101). I checked into my hotel, got some food, detached the Tourtech 45L hardball full of my stuff, and went to bed. 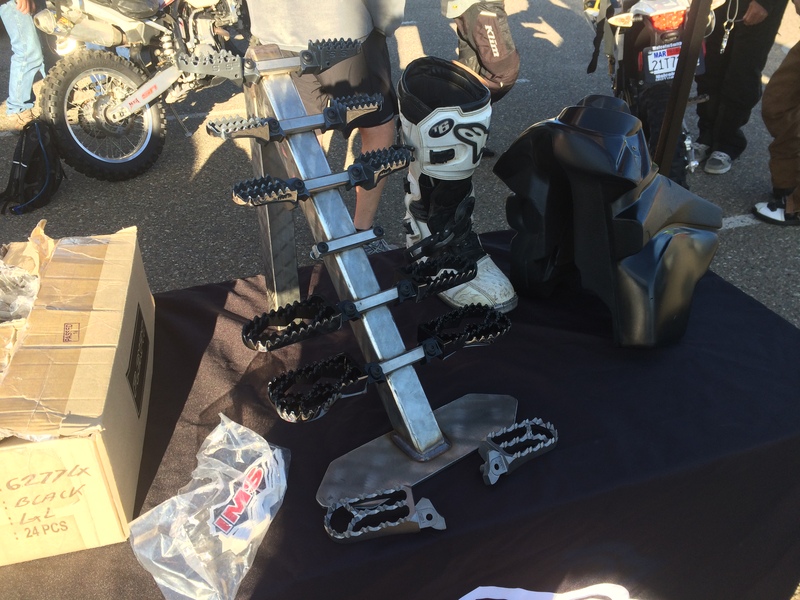 I was up early, geared up, and meet Chris and Scott at the Cal Poly University H1 parking lot at the IMS booth, showing off the new Rally Foot pegs (full review to come soon, but lets just say, they look awesome). 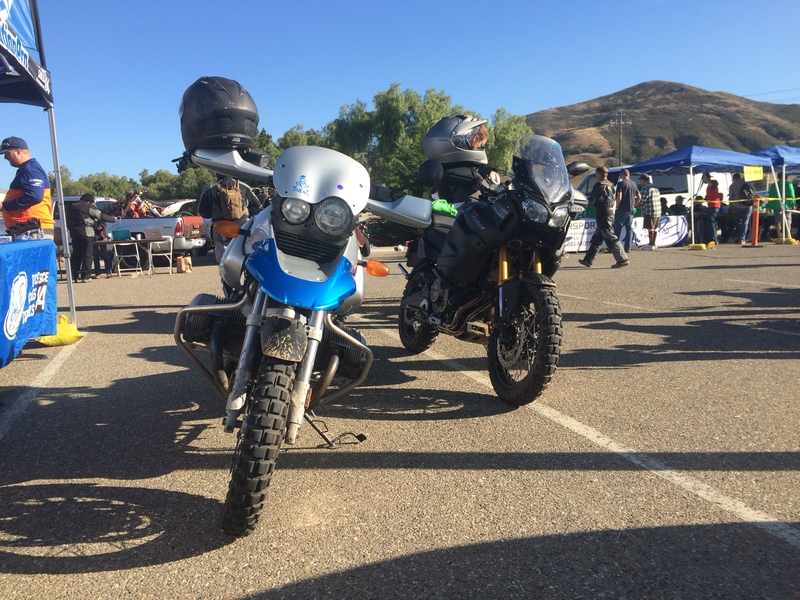 After parking the bikes to display the ADV 1 foot pegs we rubbed shoulders, walked around, meet some great people, and saw some really cool bikes. 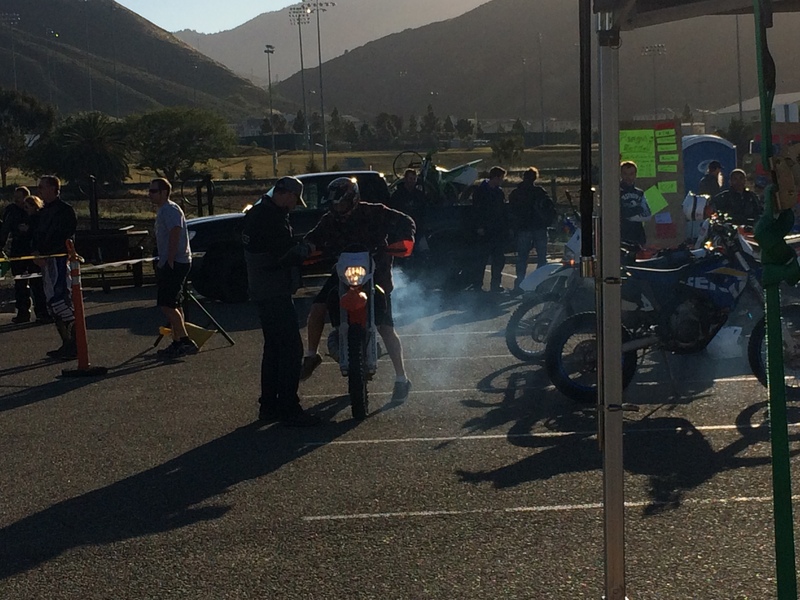 They did a rider briefing, and raffle, and by 9am, we were off. The ADV 1 pegs, ADV 2 under those, and new Rally Pegs on the very bottom. The beginning of the ride was pretty uneventful, just under 31 miles of on road riding to the first dirt. I usually ride alone, not because I don’t like riding with people, just none of the people where I live now ride a motorcycle. As a result I had a great time riding in the group. There were a few times, in the tight, blind corner roads I was a little unnerved, riding that close to the other bikes, but over all it was great fun blasting along with other riders, together. The first set of dirt we encountered was what I was expecting the majority of the dirt riding to be, nice dirt roads, a few dips and hills, pot holes and ruts, but over all nothing to super hard to do on a 500 pound ADV bike. After all these are the types of roads I normally ride on when I off-road the IMS Tiger. 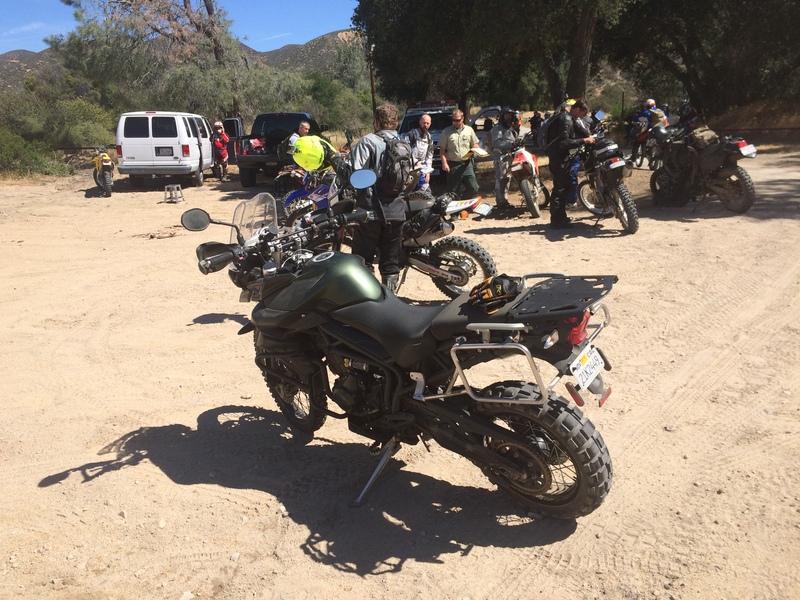 For this ride I had aired down the tires to around 22-24 PSI, which for a big ADV bike is pretty low, a far cry from the 14-16 PSI I used to run on my XR650R, and I left the rear Touratech Shock alone, set up for a 215 plus pound rider, and two fully loaded 45L panniers. How did this effect the bike, how did she perform off road? In a word, Flawlessly. The bike did great, only let down by the lack of skill of the rider. Yes, with a 50/50 tire (which the TKC80 is considered) the front end would push on hard pack, or gravel. There are some times where you just can’t deny the laws of physics, a 500 pound bike with limited grip, will push. But that was not the bike’s fault, but more a consequence of having to run street rubber for the high speed highway miles this bike does. 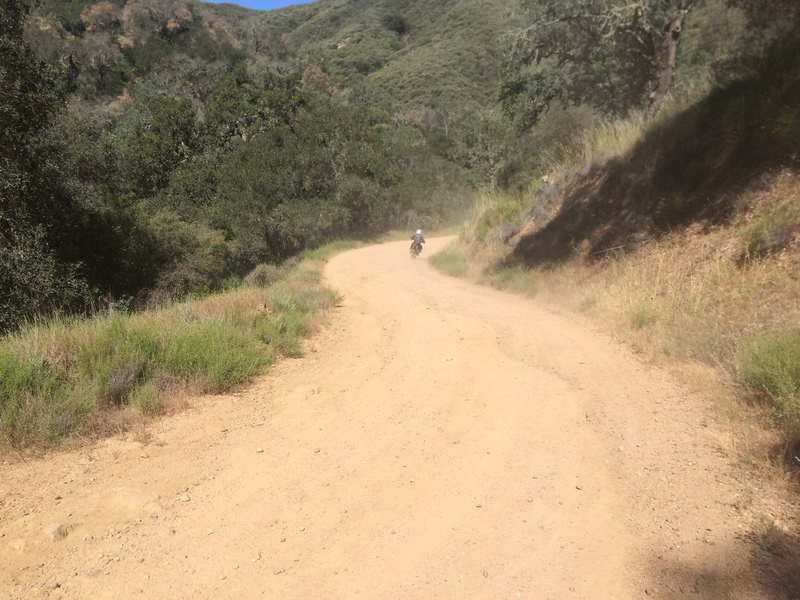 There were a few times that I crested a small hill, unable to see very far ahead due to the dust of another rider, and came upon a pot hole infested, rutted downhill that, had I known was there I would have slowed down for. As it was, I trusted the Precision Concepts forks, and Touratech rear shock, and actually found my self gassing it down such hills, surprising even myself. The bike ran over everything in it’s path, ate it, and burped it out. I can see now why many people love these bikes. 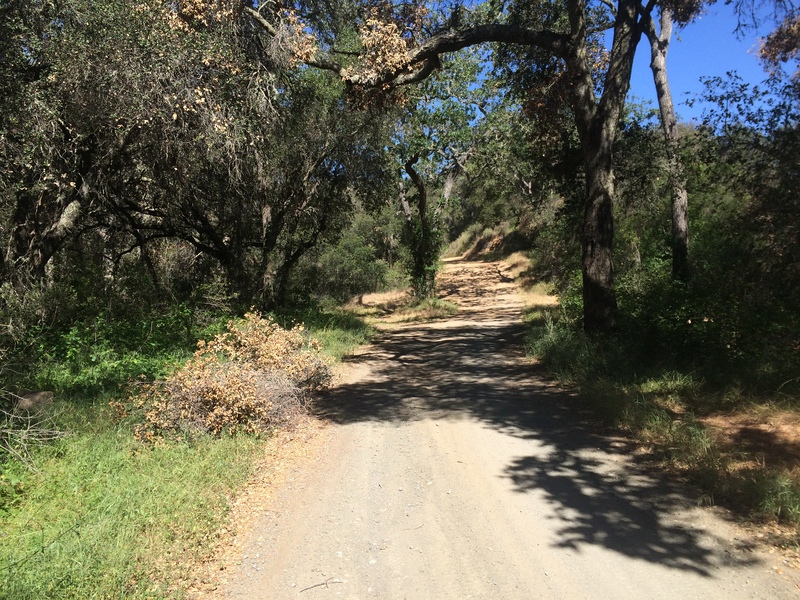 After some lovely dirt roads, we hit the asphalt again, only to transition again to some dirt roads. 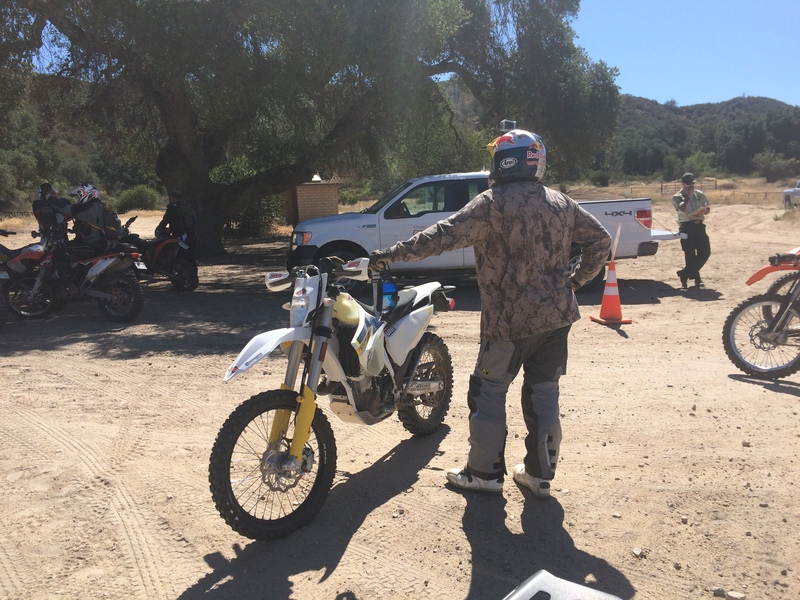 After having our spark arrestors checked, and dealing with a lost license plate, we were off to the first Ranch. Now in this area the GPS was of no use, we were going old school, with neon orange arrows marking the often very narrow single track. This is where things got fun. 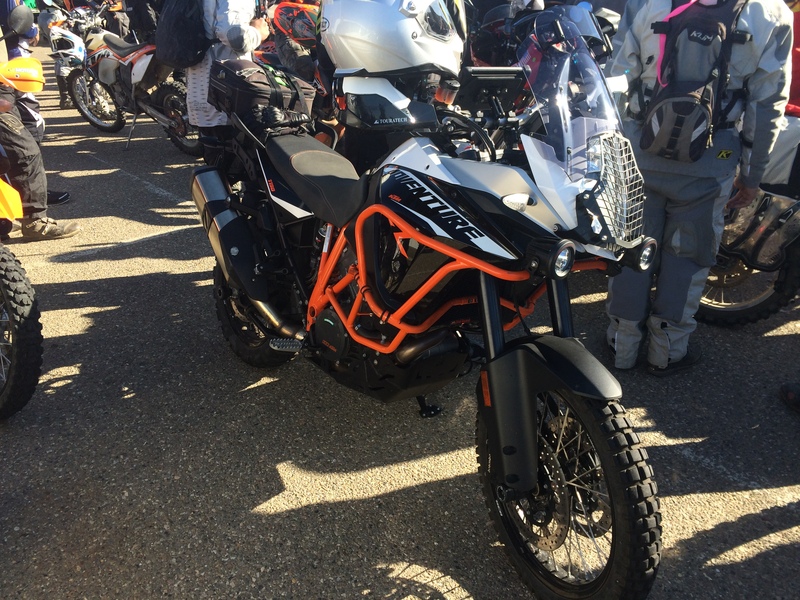 It was evident that the creators of this ride were making a true dual sport ride, not a ADV ride. This was apparent by the A. lack of big ADV bikes that showed up (5 counting me) and B. the types of trails and hills that were set up to ride. 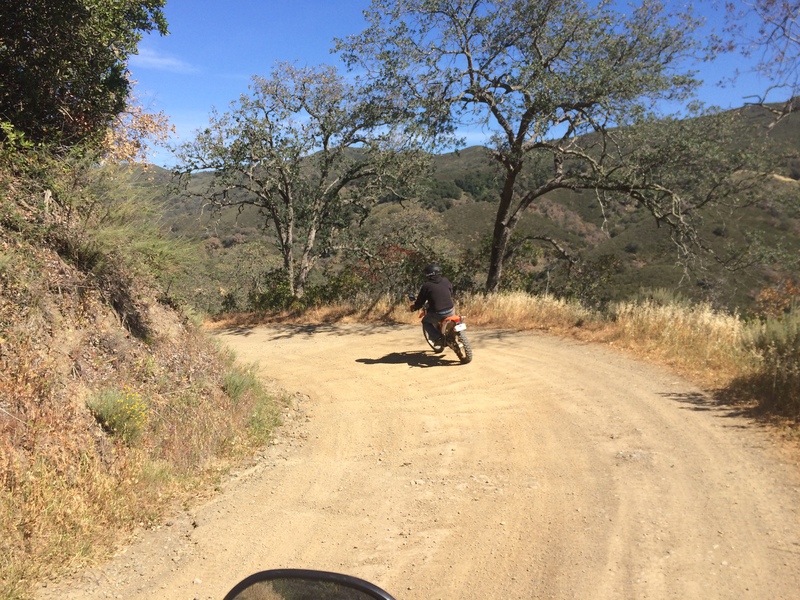 As we entered the first Ranch things were good, narrow single track yes, but nothing that the IMS Tiger and I couldn’t handle, (remember the bike could do all of this, the rider…well not so much). This was until the first of 3 major hills. 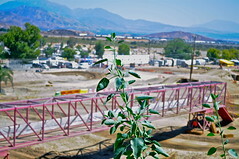 This was a hill that entered through a left hand turn through a gate, and up a 50-60 foot hill. This normally would not be a big deal, except this hill was tough to just walk up, was about 6 inches of deep powdery silt, and was littered with fallen dual sports that had tried and failed to climb the hill on the first try, and the only way to get up it was the 12 inch wide trail, the rest was tree and branch lined making other line choices almost impossible. This was the first of several tip overs. 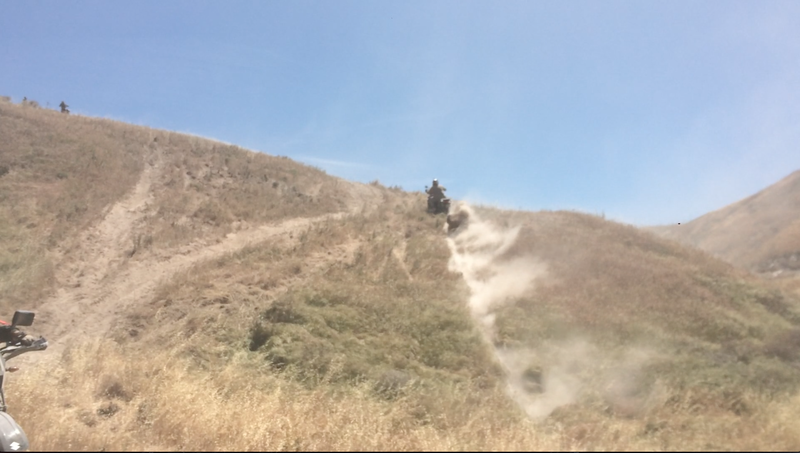 I charged up the hill, confident that I could do this, just stay to the out side edge, on the virgin not as deep silt dirt, and modulate the clutch to prevent tire spin. Unfortunately a XR650L had decided to take a nap right on my chosen line, so I cut left and almost immediately the back end tried to swap places with the front, I got sideways in a bad way, and went down. With some help, I was able to get the bike upright, aimed it down the hill and went for run number two, this time with no sleeping XR in the way. 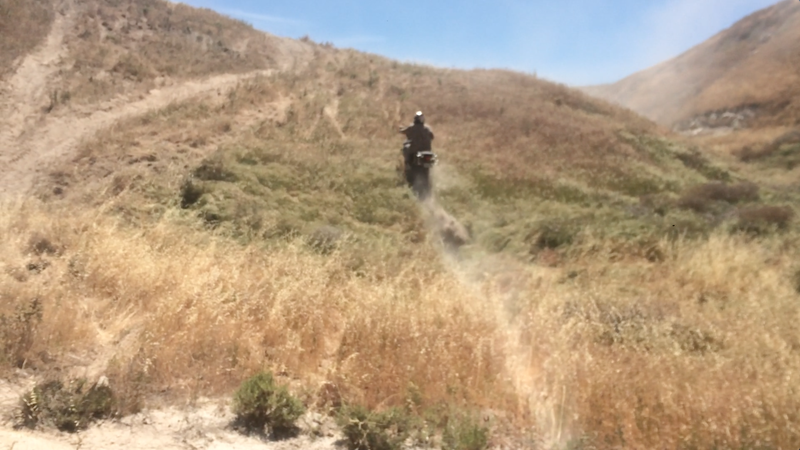 I charged up the hill, and soon discovered it didn’t matter what was in the way I did not possess the skill necessary for this amazing machine to do what it does best, conquer the dirt. After dropping the bike again, I was able to get some more help, and with Scott coaching me and pushing, I got the bike to the top of the hill. 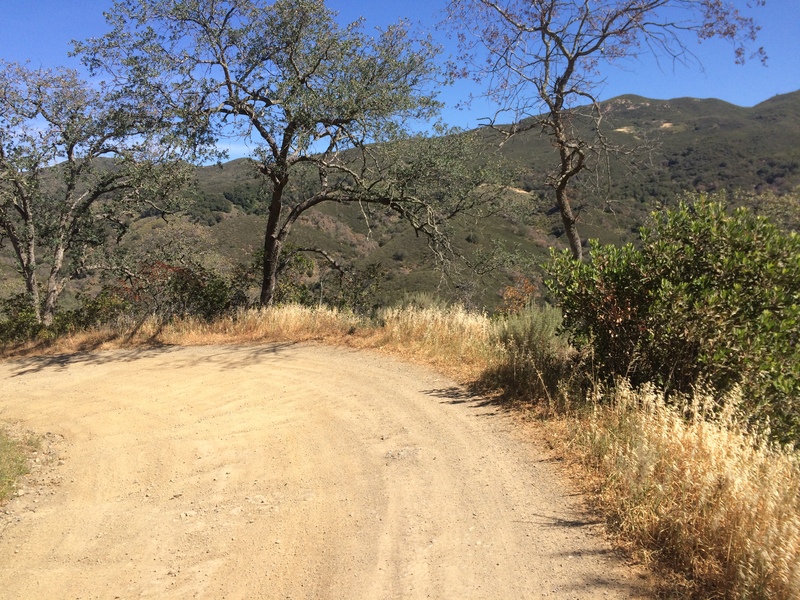 The quickly found out that it wasn’t the uphill that was the worst, but the downhill that really made you tighten up. 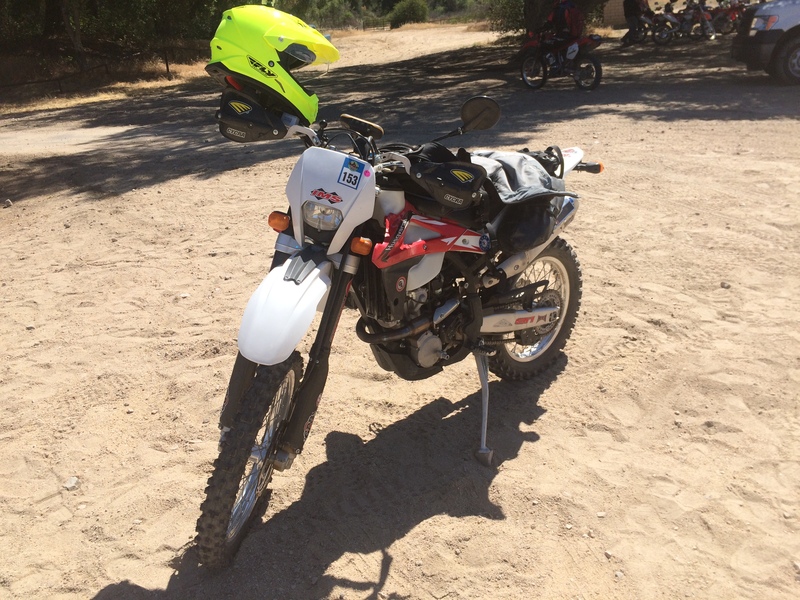 When you are riding a 300 pound XR650R, you think you got a heavy bike. When that bike has custom Precision Concepts suspension, and a 680cc big bore kit with matching HRC cam, you think you got power. 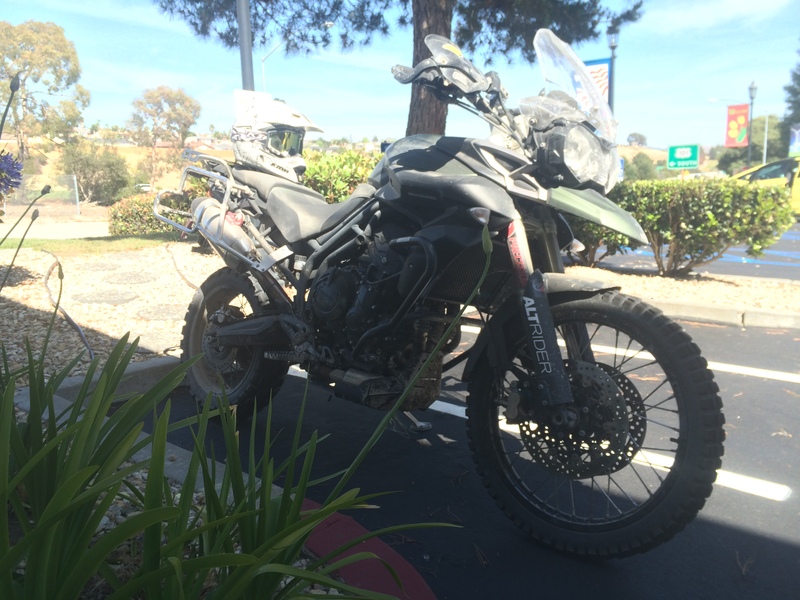 Nothing is quite like the 100 horse and 500 pound off road beast that is the IMS Tiger 800XC. This bike wanted to go faster then I wanted it to go. With the loose silt everywhere and the ruts that forced you to go where they wanted, and with 500 pounds keeping you where it wanted, it was a different experience. Yes, it would have been easier on my old 650R, but better, well, that is debatable. I loved every minute of it, the bike, the ride, the people around me, all of it. we headed out, I got lost, and then was found (there is a metaphor in here Luke 15, Prodigal Son) and came upon the Hill from Hell. It was a steep downhill to a right hand up hill to a left hand up hill, all in deep deep loose silt, that had been abused by probably over 100 riders by this point. After looking at it, muttering “you got to be joking” a few times I finally had my turn. After watching over half the field try and fail to make the hill after the first, second, and sometimes third try I knew I wasn’t going to make it first time either, but hope springs eternal and I went for it. Trying a different line recommended by the Cal Poly Penguin spotter I charged straight down the hill, saying screw the turns I was just going straight up this hill. I made it to the right hand turn, the first of the two turns, hit a dip and plowed into it like a bull. Those laws of physics came into play and the bike stopped, but me being significantly lighter then the bike, didn’t. I went head over tail smashing my helmet onto something incredibly hard, and landed on the ground, the bike simply fell over, ran for a second and then stopped. I have never been hit so hard in my life. I immediately stood up to save what was left of my dignity, and walked the few steps over to the bike to pick it up. I almost immediately started to black out, my vision started to narrow to a black tunnel and I had to use the bike to steady myself. But being a male I refused to acknowledge that I was swimming in a sea of almost solid black, and with some help hauled the bike upright. Scott had already climbed the hill, with an ease of a seasoned Pro level rider, and was walking down the hill to check on me. The fact that to me it looked like two Scotts were walking down the hill kind of told me that there was no way I was climbing that hill on anything other then my own two feet. Giving the bike to Scott I got a chance to see what the Tiger could really do in the hands of a real rider. 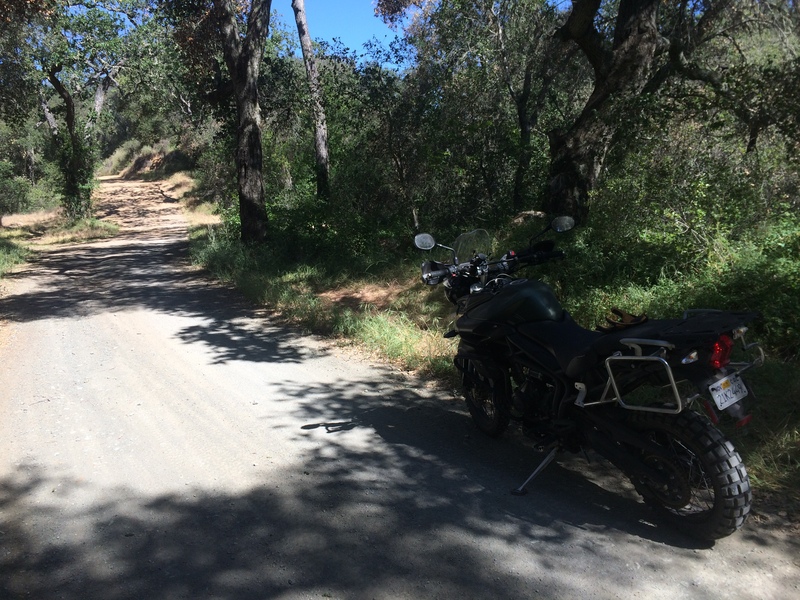 Basically it looked like any ole Sunday ride in the dirt, the bike simply went up the hill. The hill was still deep silt, the grass hid the many many pot holes, and the bike still weighed 500 pounds, but Precision Concepts and Touratech knew what they were doing when they did the suspension, and Triumph knew what they were doing when the built that engine, and the bike did what it was supposed to do and made that mountain into a little mole hill. Like the hill wasn’t even there. 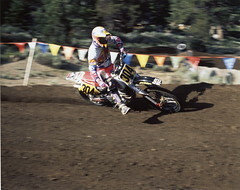 Scott Wright on the IMS Tiger. 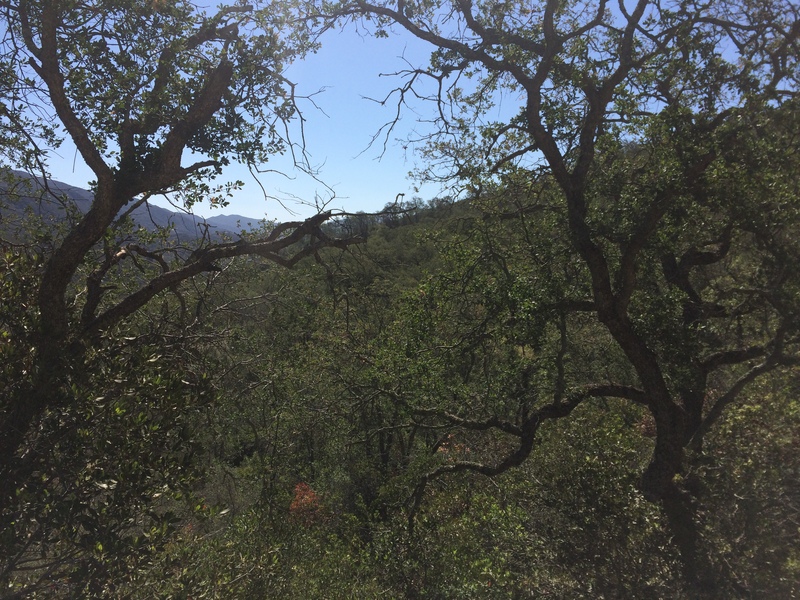 After a long miserable hike up the hill, I mounted up and we finished the ride, there were a few more hills, all of which paled in comparison to the Hill from Hell, and I was able to ride up in the first try. 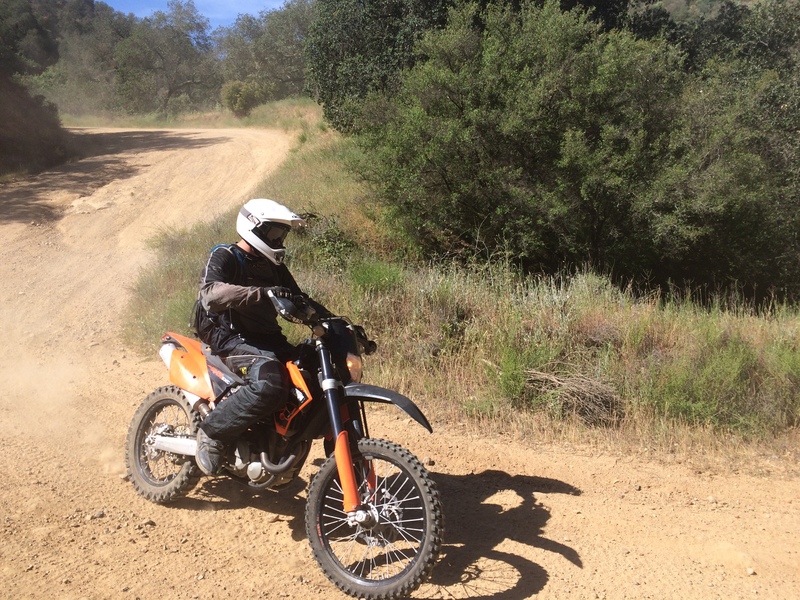 The downhills were still frightening, where I pulled over a few times to watch the much lighter KTM bikes skip down. But finally it was over, and I have never been so glad and yet so sad to see pavement in my life. In the end I had a blast. The bike was perfect, yes it is a big heavy beast, yes I need much more time off road to learn how to ride the thing to it’s full potential. But in the end I wouldn’t trade this bike, or that ride on that bike for anything. It isn’t the ride that you win that sticks with you, trophies fade away and glory is eclipsed by another better rider, but it is the ride that you stuck it out and finished that matters. “Coming in dead last with nobody but an old man and a flash light was the greatest victory I ever had.” said a rider to me once, and after this ride, waking up the next moring with bruises and aches I didn’t even know I had, I think I see what he meant. It was more about the fact that I did it, on a bike I had never really tested on this hard of an off road course, that is what mattered. Yeah, on a KTM 450EXC this ride would have been easier, or my old Baja Preped XR650R this ride would not have been nearly this hard, but it didn’t matter, what did matter was I did it. I did it on a 500 pound, 90% street ridden ADV bike, and I could ride it home the next day, in comfort, and style, 160 miles. 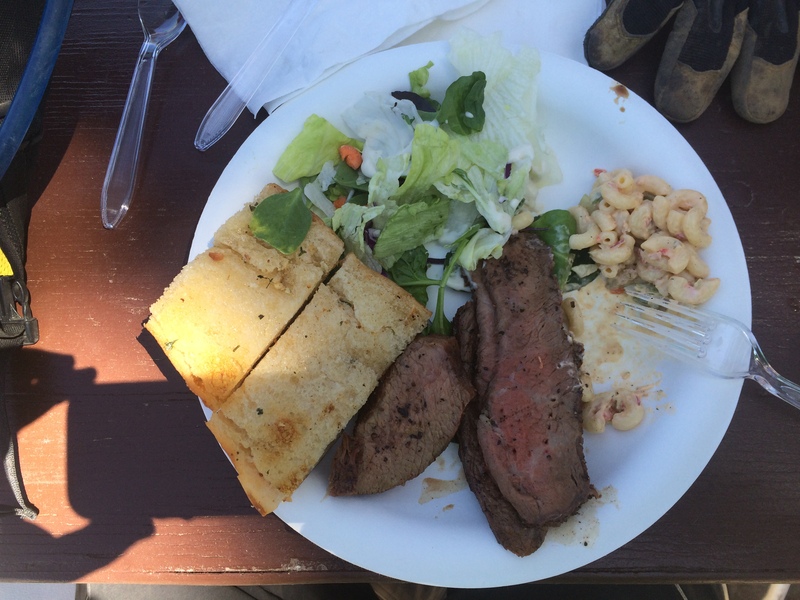 This is what Adventure riding is all about, this is why these bikes are so popular. It just makes sense, these bikes will get you there and get you home. In the right hands with the right amount of forethought (in gear, suspension, and trail choice), these bikes can do it all, and do it with more comfort and style then any dual sport. Not to sound like a paid advertisement, but I really can’t say enough about the suspension on this bike. Precision Concepts once again did a great job, they took a soft, and heavy brake dive front end, and made it a work of art. This floated over bumps, dips, pot holes, ruts, and rocks. 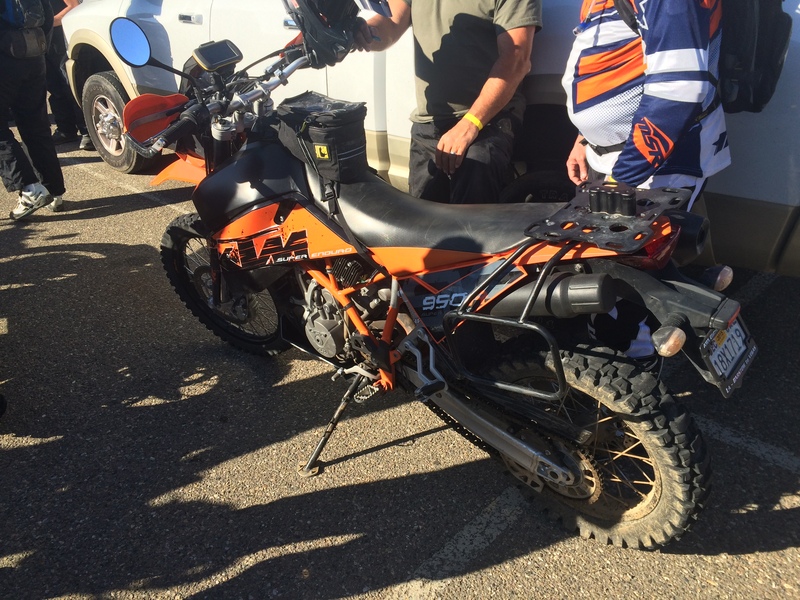 It didn’t miss a beat, didn’t wander, shake its head, or lose control ever, only the tires (being 50/50 dirt/road tires and the rider) letting them down. As for Touratech, wow, just wow. Yeah this shock is expensive, but anything this good will be. At slow speeds the shock could have been softer, it was set up to handle me (215 plus pounds all geared up) and full panniers, but once you got the speeds up a little, to where the fun really happens, the rear shock just motored over everything, and asked for more. It didn’t matter the terrain, the bike just moved over it like it was smooth asphalt, and made a hero out of a Average Joe. Thanks again to the Cal Poly Penguins and all the sponsor that made this ride possible, and I will see you again next year. This entry was posted on April 28, 2015 by imsoffroad. 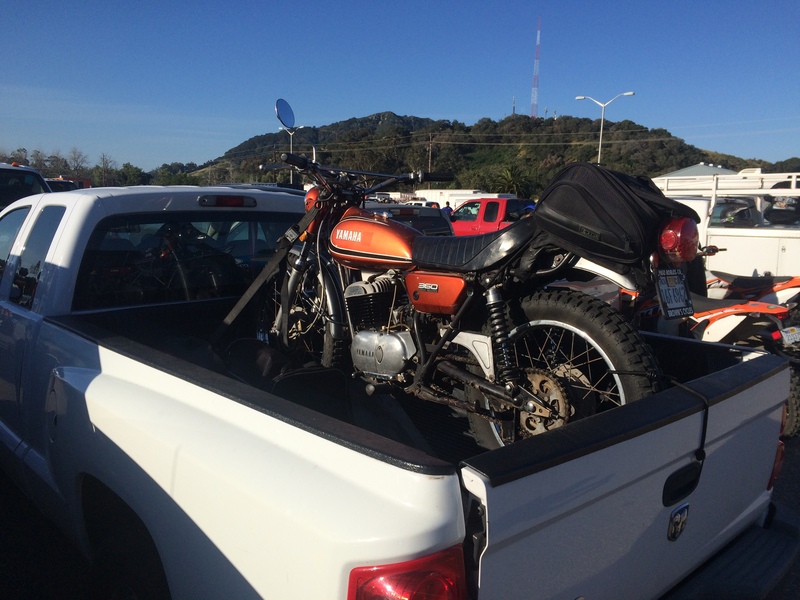 It was filed under Uncategorized and was tagged with 1200GS, 310, 450, 501, 650R, 800, 800xc, ADV, adventure, adventure riding, Big, bike, bikes, Cal Poly, California, Dual, dual sport, Hi Mountain, Husky, ICON, IMS Products, KTM, Penguins, Sport, Tiger, Triumph, XC.